Like A-list movie stars, the Canutillo High School Class of 2016 walked the halls as heroes of the schools they once attended. 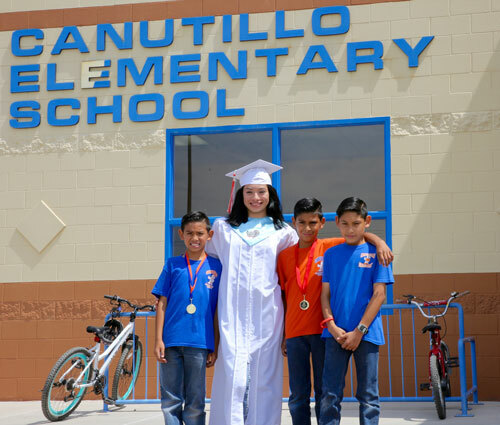 The graduating seniors visited each of the lower campuses of the Canutillo Independent School District, dressed in their academic regalia, inspiring the younger students to complete their own goals of graduation. The soon-to-be graduates were celebrated and some brought to tears when the crowd of former teachers, parents and siblings who are attending their former schools greeted them with high-fives and cheers. For one graduate visiting Canutillo Elementary School, the day was especially emotional. “I’m the oldest of my family and I’m just so happy to show my younger brothers and sister that I did it and they can do it too,” senior Rita Moyers said. Like Moyers, many graduates stopped in their tracks to embrace their siblings and former teachers, staff and coaches in the halls. Enthusiastic students at Jose Damian Elementary School cheered, “Go, Eagles, go!” while fascinated pupils at Congressman Silvestre and Carolina Reyes Elementary School asked the seniors for autographs. CES Principal, Julie Melendez, believes the senior walk is a great thing to do. The Canutillo High School graduation ceremony will take place at the Don Haskins Center on the UTEP campus, Tuesday, June 14 at 6:00 pm.